Ever feel like the walls, ceiling and floor are closing in on you? For sometime now, I've had commitments on my calendar that use to be far off in to the future. But now, those commitments are looming quickly. Adding to the mix, the phone has been ring off the hook with new assignments. Don't get me wrong, I love to shoot, and I happy for the work that's recently come in. It's been a bit slow on the assignment end of things. However, I've been busy with many other projects other than work. I don't think of myself as a procrastinator, however, when my attention is taken away from a current project or endeavor I feel like I'm spread a bit thin. It's a balancing act or sorts, it reminds me of the plate spinner on the Ed Sullivan Show from years past. I find it hard sometimes to keep all those plate spinning all the time. I'm trying really hard to prepare future post for the blog in my free time. As I look at my calendar, I'm reminded that I don't have much of it. 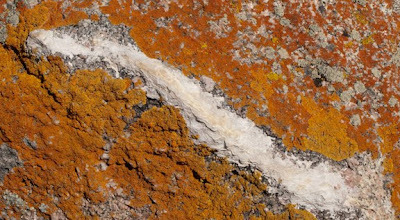 I leave for a week of workshop teaching at Maine Media Workshops early in September. I'll be teaching a workshop called; Location Lighting, Lite & Compact. Right after that, I'll be in Downtown Boston, teaching a 2 day workshop for the Nikonians Organization. I'll be teaching advance lighting techniques using the Nikon CLS method. If you are interested in either of these workshops, there still space for both. I have several shooting assignments to address before leaving town as well. Which adds more pressure to the mix, one of those assignments are scheduled on the day before I leave for Maine. Sometimes I think I'm crazy, but it's work and when work comes in-you take it. 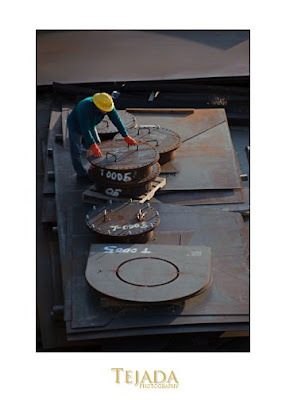 I had a lot of nice emails about the last post, Storage Tanks & More. Most of those emails expressed how much they had missed the assignment type posts. I enjoy sharing my assignments and having some interesting video to go alone with it. I'll have a few more of those in the next week or two. In the meantime, I'll do my best to continue preparing blog posts for the time while I'm on the road. I might also mention, when I get back from the east coast I'll be conducting one of my Small Strobes, Big Results workshops here in Denver. That workshop will be held on September 26th, I still have a few more spaces if interested. For more info click HERE. Last week, was a very busy week for me. I had 4 days of assignment work ranging from Agriculture to Health Care and even Oil and Gas subject matter. In today's economy it nice to have a week like that once in a while! In this post, I'll be dealing with the industrial shoot we had. 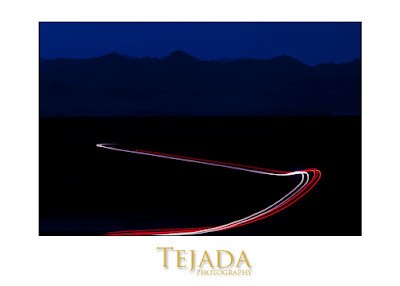 I was shooting for a returning client based in Oklahoma, I shot an assignment for them several years ago in Grand Junction, Colorado. My assignment last week dealt with a new (very small) crude oil storage facility. This storage facility is located about an hour northeast of Denver. It's the type of facility that allows tanker trucks to drop off loads of crude for future downstream delivery. The facility has 10 truck bays which allows the tankers pull into and off load their crude. I was commissioned to document the new facility for my client. I had several problems to deal with on this assignment, sun placement was just one of them. With location work, you never know what you're going to find until you arrive on location. The morning I arrived at the location was the first time I was able to put my eye on it. This first thing that struck me when I arrived, was the relatively small size of the plant. It's my job of course to make it look really big and cool. We had a beautiful sunrise the morning of the shoot. I managed to get a few shots of tankers arriving at the plant with the early morning light. The client informed me that the busiest time for the tanker activity was between 11 AM and 2 PM., not the best time of the day for shooting. 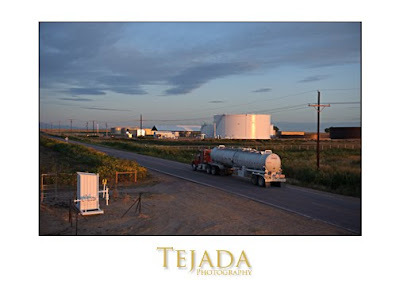 Because this facility is all about storage, showing storage tanks and tanker trucks in a photo together makes sense. A shooting position that allowed a view of both together meant shooting straight into the sun. All the trucks pull in facing the storage tanks allowing me only a rear end view of the trucks. 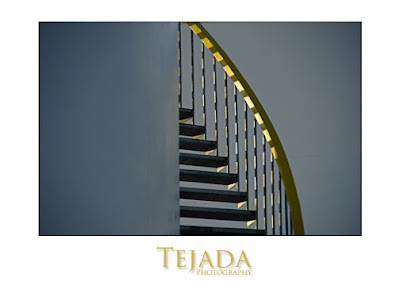 I also had clean new storage tanks to play with, stairs winding around the tanks with smooth lines of composition. With the use of walkie talkies am able to position my subject (Erik) where I need him in the photograph. Walkie talkies are my most favorite piece of non-photographic equipment. By late morning, a few workers had shown up for work. Contractors where there to finish wrapping some thermal insulation around exposed pipes. The location where the work was being conducted was in the shade. Behind the work were sunlit storage tanks which I wanted to include in the photo. The only way for us to bring detail into the shaded work was to pour some light of the activity. We put together a SB-800 with a Quantum Turbo SC to power it, I just love this battery. The tanks in the background were very bright, my exposure was 1/250th @ f/10.0. I had Erik put the Turbo SC in his pocket and handhold the SB-800 out of frame on the right side. At such a steep f-stop f/10 I was using full power on the strobe. I fired the strobe using my Radio Popper PX system, which allowed me full control of my flash in bright sunlight and great distance. I wanted the light from the strobe to come from the same direction as the sun, which was lighting the tanks in the background. 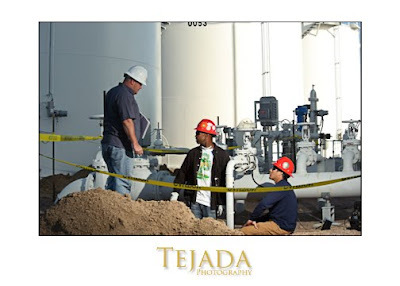 This storage facility was brand new and still under construction, they still had 2 additional storage tanks to complete. 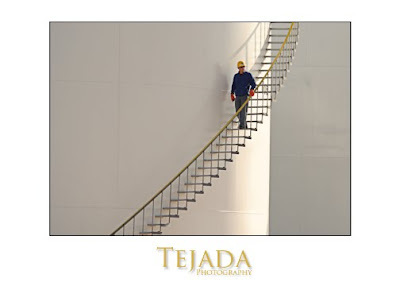 I climbed one of the completed storage tanks which gave me an excellent vantage point to photograph. Inside one of the tanks under construction, I placed Erik in a location that shows cut metal parts used in the construction of those tanks. We did manage to shoot a little video on this assignment, you can see some of the antics here. I was recently given the opportunity to try out the new Quantum Qflash TRIO and Qflash PILOT Command Unit from Quantum Instruments. The Qflash TRIO is really interesting, it's a shoe mounted flash that combines a Qflash head with built-in "FreeXwire" TTL radio and QTTL adapter for digital cameras. I used the Qflash PILOT to control the TRIO remotely, I liken it to the Nikon CLS system on steroids. The Qflash TRIO and PILOT is designed for specific camera systems, ie. Nikon or Canon. As most of you know, I'm a Nikon shooter and a firm believer in the Nikon CLS system. I love the technology that allows the photographer to control their flash system remotely for their camera position. The TRIO and PILOT combo is design with that in mind. Quantum Instruments has designed their system to work similar to the CLS system except for one important difference. The signal for the PILOT command unit sends a radio signal rather than an Infrared signal. The Radio signal that is emitted from the PILOT command unit allows you to control the Qflash TRIO at a distance of 500 feet. You can control and synchronize any number of remote Qflashes in Manual, Auto, Auto-fill, TTL and even High Speed Sync to boot. future upgrades that can be downloaded to the flash. The Qflash TRIO next to my SB-800 is a bit larger for sure. My own testing showed me that the TRIO is twice as powerful the SB-800. 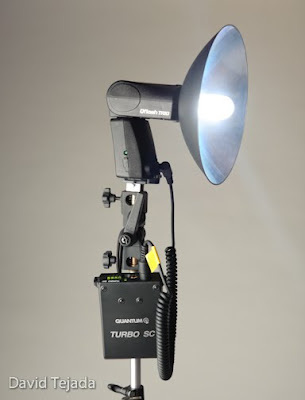 The TRIO has a removable reflector, allowing for a true bare bulb flash application as well as the ability to put on additional reflectors and other light modifiers on. This is not the first time using Quantum products for me. I have an old Qflash Model T that's still firing away after so many years, in-destructible! Because the Qflash TRIO and my Model T use the same reflector system, I am able to use my QF63B Telephoto Reflector and Grid sets on the TRIO. The Telephoto Reflector shown above, is a highly polished 8 1/2" reflector that throws an 18 degree beam at great lengths. The reflector comes with a spacer which must be installed to achieve the tele-effect of the beam of light. Using the spacer will increase the light output by as much as 2 stops or a standard Qflash reflector. My grid set for my older Model T Qflash fits on the TRIO as well. I keep my grids and cut gels in a small plastic container I found at my local market. You'll need an external battery to power the strobe. I've been using the Quantum Turbo SC to power the flash. The Turbo SC is very small and powerful battery, it's lightweight at only 15 oz. 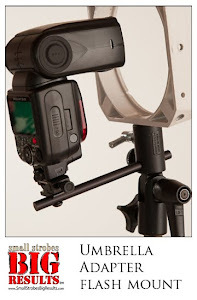 and it provides up to 225 full power Qflash shots or 400 shoe mount flash shots like that of the TRIO & SB-800's. Now that's a whole lot a power is a small package! With recycle times of about 1 second for a full power blast, in my mind, the Trubo SC is the way to go. Hey, just a quick reminder. 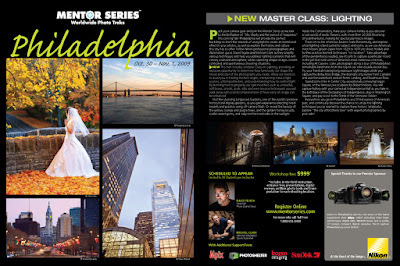 I'll be in Philadelphia, PA conducting a Mentor Series Trek October 30th - Nov. 1st. For more info, visit the Mentor Series Web Site. I have just returned from a wonderful weekend with my wife. 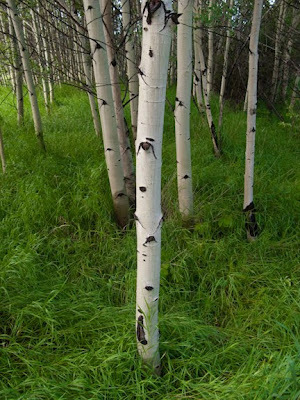 For my birthday this year, she and I attended a 3 day retreat of Yoga, Meditation and hiking in and around the Roosevelt National Forest near Red Feather Lakes in Northern Colorado. 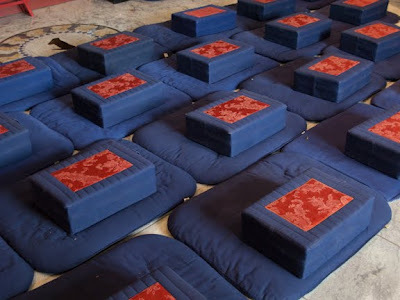 We attended a program held by the Shambhala Mountain Center, my wife has been receiving their catalog for years and thought the course description sounded like fun. 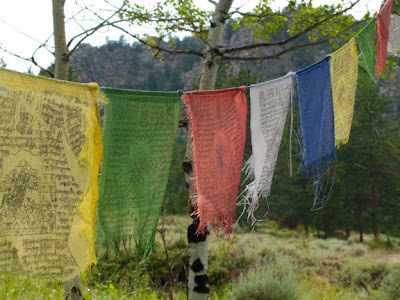 Most of the courses are centered around learning about Buddhism, Meditation, Yoga, and Health & Healing. Personally, I had never done yoga before and as far as meditation go's, no formal training. I enjoy hiking, and thought the yoga and meditation sounded cool. I really enjoyed the relaxation and learning a little about the religion of Buddhism. It's my understanding that Shambhala is a sect of Buddhism. Anyway, it sure was interesting, I enjoy leaning about new things. 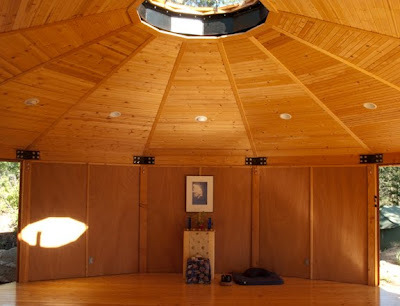 At the Shambhala Mountain Center they have this thing called a Stupa. They say it is the largest Stupa in North America. The Great Stupa is one of the most significant examples of Buddhist sacred architcture in the world. 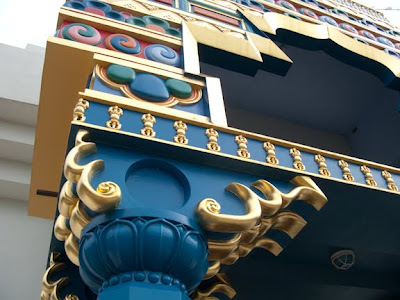 The Stupa is filled with original art and sculpture that preserve the endangered cultural heritage of Tibet. 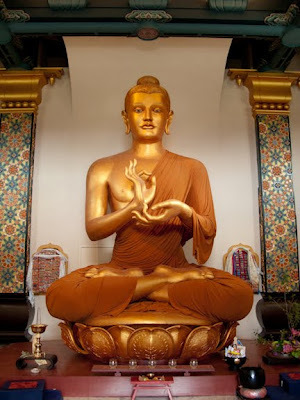 Inside this Stupa is a 20 foot tall seated Buddha, and beautiful art work. 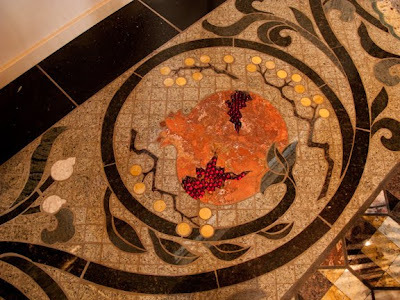 Really beautiful floors! This section is of a pomegranate, the red seeds are loose stones, really cool. I might also note that all the photos where shot using my Canon G9. Since we we're hiking this weekend, I wanted to pack light. The Great Stupa, which I kept calling the "Super Stupa" is about 110 feet tall on the outside. 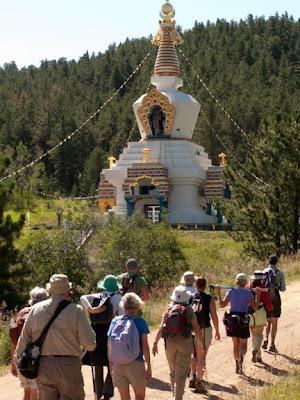 Here you can see our group heading out on a hike, passing the Super Stupa. Anyway, I had a wonderful birthday, hiking, doing a little yoga and meditation. Here are a few more photos from my weekend. Hope you all had a wonderful weekend! There are times when you just have to shoot for yourself. 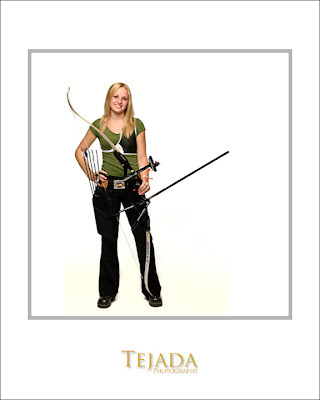 I phoned a local archery center and asked if I could photography at their center. 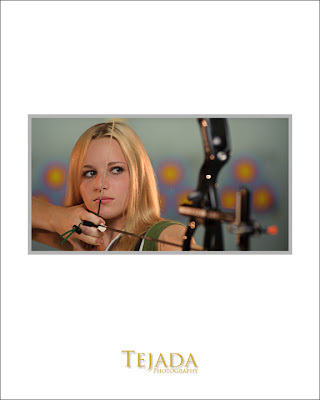 I wanted to photograph an archer and possibly some action shoots of target shooting. The gentlemen I spoke with on the phone (Glen), was a wonderful guy and was very helpful finding someone that I could photograph. Glen told me about a young lady named Jessica who happens to be 4th in the world in her class or division. Not only is she a true champion, it was a real plus to have such an attractive subject to photograph. 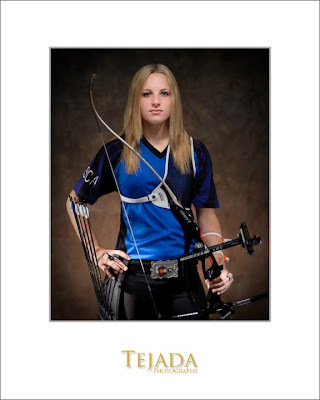 We spent about 3 hours shooting Jessica at the archery center, we where able to create several lighting setups during that time. The photo at the top of this post was shot using 4 Nikon SB-800 strobes. The key light was a LumiQuest Softbox III powered with an older Quantum Turbo battery that I have in my arsenal. The key light was boomed overhead and the light striking Jessica's face was from the feathered edge of the light. I had 2 additional strobes snooted with LumiQuest snoots, these are easy snoots to use and they fold flat for easy packing. These strobes where placed on either side of Jessica in order to put pools of light on her hands and equipment. 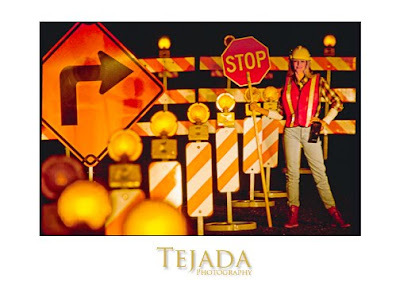 The last strobe was placed behind and to the right of Jessica as a background light. That strobe had a full cut CTO gel over the head of the strobe in order to warm up the light on the background. I also brought alone a roll of white seamless paper to photograph her on. The key light on this shot was a single SB-800 inside a FourSquare™ and triggered using a Radio Popper. I used two SB's to light the background, your background should be about 1 1/2 stops brighter than the subject. Since I do not use a meter any more, I use my highlight detection (blinkies) on my LCD screen on the camera to determine the value of the white. On the above photo, I used my 5 foot Octabox on a boom over head for the key light and 2 SB-800' s with full CTO gels on them used as kickers. The background was lit using the existing light provided by daylight florescent lighting. I have a few more projects I'm trying to power through and I'll be sharing those with you as they are produced.